This Ancient Greek mythology themed video slots game has 5 reels and 20 pay lines. It is powered by Party Gaming Software. Zeus, the god of sky and thunder, will help you win more money in this game if you get to land his symbol a couple of times when playing this exciting game. Getting a winning combination in this slots game will not prove too difficult. Symbols in this game include Apollo, a coin, Amphora, and Griffin. The coin size ranges between 0.01 to 20. The maximum bet per spin is 400. The ‘Autoplay’ feature is readily available for use. This is represented by Zeus and appears on reels 2,3 and 4. This can substitute for all other symbols except the scatter symbol to complete winning combinations. If this symbol appears on all 3 reels at the same time, it awards the Artifact Feature. This bonus game is triggered once you spin 3 Zeus symbols on the middle reels at once. You get to select tiles from a Zeus mosaic made up of 20 tiles to reveal treasures. Find 3 matching tiles to win the amount they reveal. This feature can also be won during the Free Games Feature. When 3 or more Acropolis scatter symbols appear on the reel, the player gets rewarded with up to 15 free spins. Wins during these free spins are tripled. Free spins can be re-triggered within this feature. There is no bonus symbol and multiplier symbol in this online slots game. 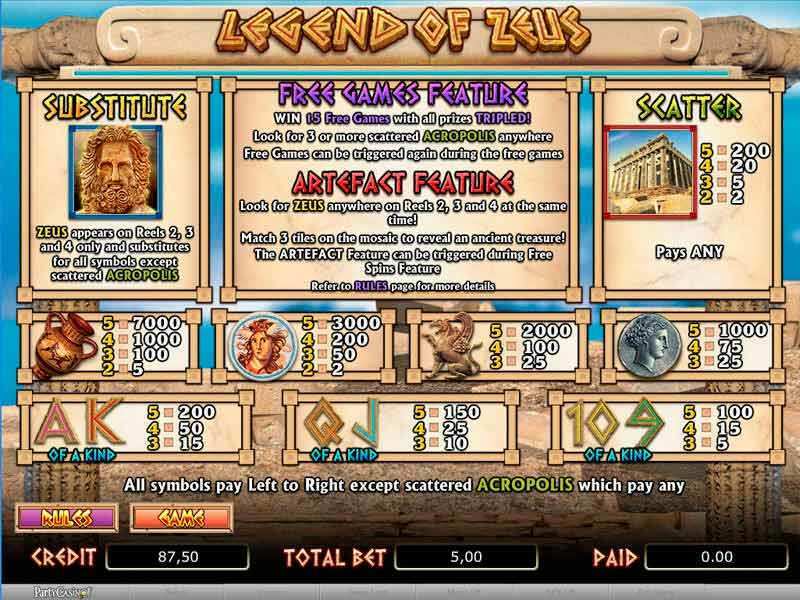 The jackpot symbol which is the vase pays 7000 coins which is the largest jackpot value in the Legend of Zeus game. To win this, you require 5 Zeus symbols on an active line. To achieve a maximum payout, play with the maximum number of active lines to help increase your winnings. Use the wild and scatter symbols to increase your winning chances. Trigger more free spins when using the 15 free spins awarded after landing 3 or more scatter symbols to ensure you get more winnings. Match 3 tiles in the bonus round to win even more prizes when playing. Legend of Zeus is a game that is fun and keeps you interested from start to finish. Legend of Zeus boasts some of the best graphics and sounds thanks to Party Gaming who develop awesome games based on popular themes and movies. Their games are some of the best video slot games available online to be played for free or for real money. For any high rollers seeking slot games with maximum bets to ensure maximum winnings, Legend of Zeus slots is the ideal game to play. This game is available at online casinos such as Party Casino among others. Types of slot games you can play if you enjoyed Legend of Zeus are penny slots and high roller slots games which are also available online. 0 responses to "Legend of Zeus Slot"